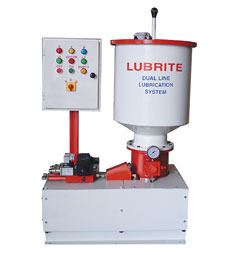 LUBRITE DUAL LINE system is designed to provide a positive means of dispensing lubricant to the bearings on a machine from a central pumping source. the versatile rugged equipment offers flexible in design and economy in operation. LUBRITE DUAL LINE PUMP Consists of Reciprocating Motor Driven Plunger Pump with inbuilt Gear Box. The Pump incorporate a large grease reservoir with a heavy follower plate and tell Tale Rod. Limit switch is provided on the top of reservoir to indicate full and empty level of lubricant.On the pump Outlet , check value, pressure relief value, bleed value, inline filters are provided and it is connected to direction control value ( Reversing Value). 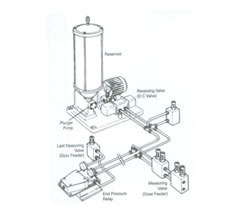 The DC Valve gets signal from pressure switches (end pressure ralay) mounted on each line.The whole system is controlled with electric control panel. A central pumping station pushes lubricant through a reversing value (direction control valve) to either one of the supply lines. these lies run along the machine to feed Lubrite Dose Feeders (measuring valves) mounted on the machine at a convenient position to be seen and close to the points to be lubricated . 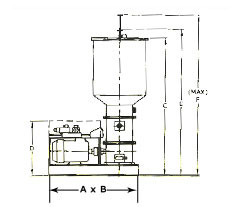 The Dose feeders are operated by hydraulic pressure from the pump delivering a metered quality (Dose) of lubricants to the bearing being served.